While the Town of Genoa and Genoa Peak create a beautiful setting for this event, the combination of terrain and altitude can make for some challenging trail running. There are several technical segments along the course. 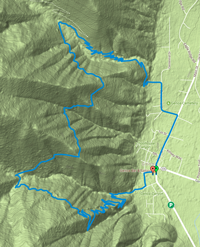 Some of these technical elements include rocky, uneven and narrow trail, steep drop offs, several creek and spring crossings, plus a scramble to the top of Genoa Peak. Please be aware that these elements increase the risks for falls and injuries to all runners. Bears, mountain lions, and bobcats are also frequently seen in this area. Headphones are strongly discouraged as every runner needs to be alert and aware of their immediate surroundings and to the potential risks and dangers that exist. Due to the amount of elevation change and other potential hazards that exist, the 25 mile event is not recommended for those who are new to trail running. All runners must be prepared to carry all their nutritional needs with them throughout the entire length of the course as well as a sufficient amount of water with them between aid stations. No garbage will be collected at aid stations and all aid stations are cup free. THE START AND FINISH for all distances is at the Trimmer Outpost in the historic Town of Genoa. From the start, all runners will proceed on pavement .5 miles north on Jacks Valley Road before turning left on to Centennial Road (dirt). From here, runners will traverse North behind Genoa Cemetery on Centennial Road for about .5 mile before turning left onto Snowshoe Lane. This short road quickly dead ends and turns into the trail head for Sierra Canyon Trail(single-track). Runners will head up Sierra Canyon Trail for approximately 2 miles before reaching the Discovery Trail and the first aid station. They then turn right onto the Discovery Trail for .3 of a mile before turning left back onto the Sierra Canyon Trail and continue their long switchback ascent toward Genoa Peak. This section of trail offers some technical running combined with fresh mountain springs and tall pines that offer magnificent framed views of Genoa and the Carson Valley. Their journey proceeds uphill for an additional 7.6 miles from the Junction Aid Station with over 2600 ft. of elevation gain. After climbing seemingly endless switchbacks they will crest the top of Sierra Canyon where they will be greeted by volunteers from Genoa Peak Aid Station, the highest aid station on the course at 8408 ft. From here it is .7 of a mile to the summit of Genoa Peak on a steep forest road that climbs an additional 742 ft. At the top runners will be treated to breathtaking 360 degree views of Lake Tahoe, the Eastern Sierra Mountain tops, and the Valley floor below to the East. Runners will begin their descent back to the start/finish returning through Genoa Peak AS. On the descent from Genoa Peak AS, runners will return through the Junction AS. Once at the Junction AS, all runners head south on the Discovery Trail (single track) for 3 miles to Genoa Falls. From Genoa Falls there is a half mile of trail left before beginning their final decent on the Genoa Canyon Trail, which descends 1200 feet in 2 miles on narrow single track trail with tight switchbacks and steep drop offs, leading everyone back to the Town of Genoa. Once down to ground zero and onto Carson Street (dirt), they will turn left on Genoa Road (dirt) for their last few tenths of a mile to the FINISH LINE. 8 Mile – Click map for interactive. From the start, all runners will proceed on pavement .5 miles north on Jacks Valley Road before turning left on to Centennial Road (dirt). From here, runners will traverse North behind Genoa Cemetery on Centennial Road for about .5 mile before turning left onto Snowshoe Lane. This road quickly dead ends and turns into the trail head for Sierra Canyon Trail(single-track). Runners will head up Sierra Canyon Trail for approximately 2 miles before reaching the Discovery Trail and the first aid station. Once at the Junction AS, all runners will turn left & head south on the Discovery Trail (single track) for 3 miles to Genoa Falls. From Genoa Falls there is a half mile of trail left before beginning their final decent on the Genoa Canyon Trail, which descends 1200 feet in 2 miles on narrow single track trail with tight switchbacks and steep drop offs, leading everyone back to the Town of Genoa. Once down to ground zero and onto Carson Street (dirt), they will turn left on Genoa Road (dirt) for their last few tenths of a mile to the FINISH LINE.